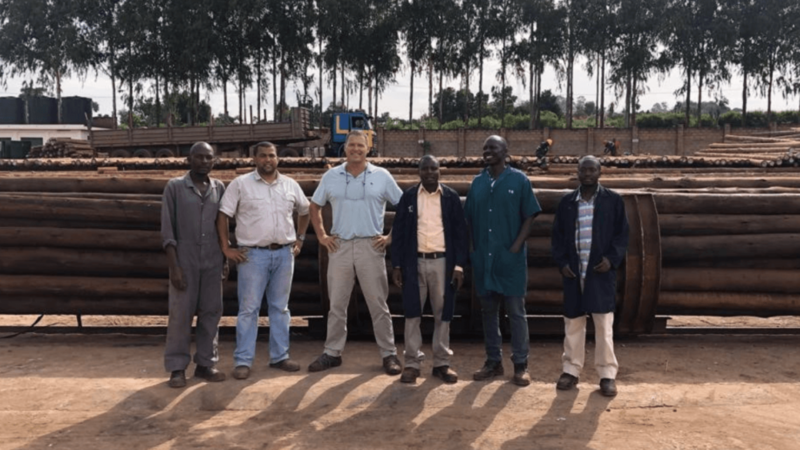 Dolphin Bay is proud to be adding value to the business of a new client in Uganda, Busoga Forestry Company, part of the Green Resources AS (GRAS) group. GRAS is one of the few major commercial forestry owners in Uganda, also operating in Tanzania and Mozambique. The group adds value to its timber through sawmilling and the production of construction and utility poles. “Busoga has always been a major player in Uganda and is one of the three largest companies supplying the bulk of poles for the government’s electrification programme. Like most of our client-relationships, this one developed over time. An agreement was reached after Busoga’s new managing director John Ferguson, who has a background in forestry, saw the value in the technical and engineering support that Dolphin Bay could offer. The upgrade was a “top-class” one, John said. “It is neat, tidy and presentable, an example of how a plant should be put together. Uganda faces the same challenges as Tanzania has experienced regarding the premature failure of many treated poles. This poses a significant threat to the future of the industry in these countries. Dolphin Bay played a facilitatory role during the Tanzanian authorities’ process of establishing new standards in line with those that are internationally respected. “We remain committed to helping ensure the sustainability of the industry in all the regions where we do business and would like to play a positive role in this regard in Uganda, too,” said Bertus.